The world’s largest airplane having a Stratolaunch behemoth along with dual fuselages and six Boeing 747 engines completed its first flight successfully. 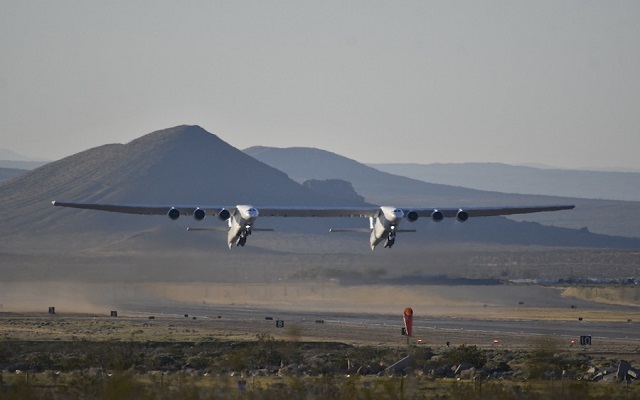 The test flight was made on Saturday in California. This mega jet is designed in such a way to carry into space and drop a rocket that ignites to deploy satellites. This giant airplane has wingspan even bigger than the football field, it is specially designed to launch rockets. The flight of the world’s largest airplane was not officially announced instead it was caught by photographers on the camera on the same place where the company was conducting runway tests. This airplane is built by an engineering company called Scaled Composites. The project was originally conceived as a partnership between Allen, SpaceX’s Elon Musk, and Burt Rutan, founder of Scale Composites, the designer of Virgin Galactic’s SpaceShipTwo suborbital space plane. Well done everyone!